Fake plastic trees , when I think of the 3d arms in rfactor it reminds me of a Radiohead song and that is exactly what any of the 3d arms are in rfactor 😉 but it gets raised again and again, today we had a post about, and people want them, and as some may have read, I did promise some some time back after release I would do something. I appreciate this is also an area that is a must have for some and not for others, nevertheless I wouldn’t want to deny poeple enjoying our upcoming ctdp06 mod, if not having those fake plastic trees prevented them playing it at all. I am not going to spend a great deal perfecting them, this took all of 15 minutes for a team to make, so it is literally not much to do for all teams, but I did these some time back and only Ferrari done right now to try it. If you don’t like them sorry 🙂 I made these based on our biped driver model used for the current driver with static arms. As such we wont support it, it wont be part of the install at release time, and I am not sure how soon afterwards I will release them, but probably of the order of the same week or fortnight or so I will make available a download, so it is simply a question of extracting some files to the team folders (and it wont cause mismatches). Also I will add some notes about how if you wanted to disable them in cockpit view, but only have them working in the tvcam, this is also possible. Regarding the CTDP05 arms email we had the other day, it has not been discusssed yet what to do, we are in a busy period right now and expect delays in replies to such things. Until they have been dicussed internally but as was asked nicely and done the right way, you will hear from on of us, at some point. Guys, your doing an incredible job. 🙂 It’s funny, I was talking to a friend earlier about how I would like moving arms. And then I check the devblog a couple of hours later and here they are! The work you’ve done is fantastic. The detail is supreme. I think those arms look a little ‘fat’, but I don’t know if you’ll develop these further. Can’t wait for this upgrade to be released. Definitely something I will look forward to. Cheers guys and keep up this amazing work. Minor Detail – Can we get ‘Push’ and the arrow put on the headrest release tabs? * Just another quick thing. The mirror arm shape is slightly wrong. It looks rather straight. The 248f1 had a slight curve, and was also slightly thinner. * The mirrors could be molded slightly further forward on the sidepod, and shaped to the edge/curve of the sidepod. *The transparent ‘shield’ infront of the cockpit is narrower and more curved, rather than flat. 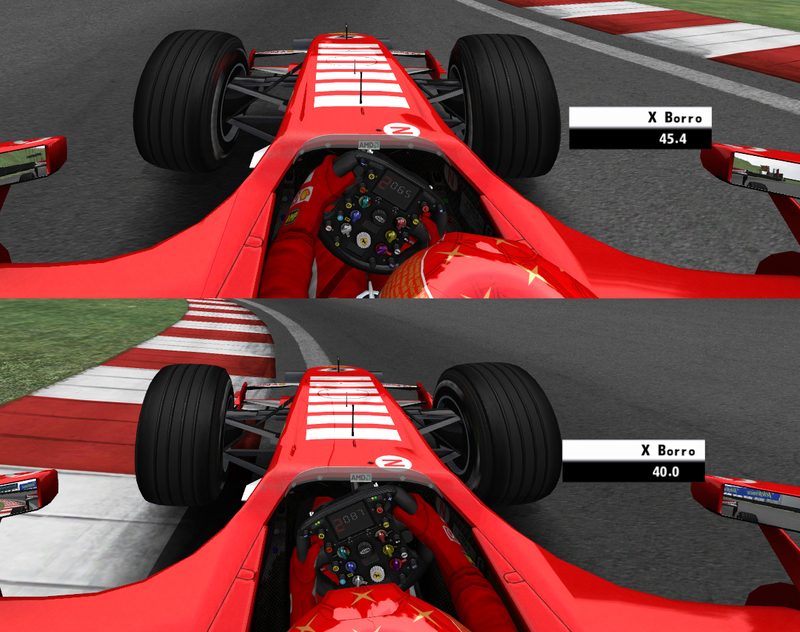 *The cockpit edges, at the front of the cockpit are narrower and more curved/shaped, not as straight. *The ends of the headrest (points) are too thin. They need to be more ‘stubby’. Infact the headrest sides are looking slightly too narrow. The release tabs are slightly closer to the steering wheel than the drivers head. *As mentioned before – the release tabs on the headrest should have ‘Push’ and the arrow. Very picky, I know. But I know you want a perfect release, and your attention to detail is second to none. It is unikely we will change any of those things. The car has already changed a bit since it original incarnation that was given to us by one of our modellers who made it quite some time ago. For insance earlier this week I reworked the fronts wings a bit because someone spotted the Monza wing wasn’t right so addressed that some degree without having to rework it too much, but that was the was the last shape change most probably. It is always the case some cars come out a bit better than others in accuracy, each modeller is different etc, some of our cars a bit more high poly, some less, some more accurate than others. Each modeller does things in their own way. It is the reality of any mod when cars are based on photos, and we, Andy (Neidryder) and me could tweak it for ever and ever afterwards when preparing them for ingame, but with what you point out, would mean remodelling, remapping texture amendments etc. There will always be something, people want a release as much as we do to get this out too, we have to draw the line somewhere. We just did a beta 3 build the other day, so that should give you some idea how far we are freezing everything, Almost certainly no more shape changes. This announcement is mainly about the arms and showing a preview so we hopefuly stop getting that qwuestion again and again, not a car preview meant for model amendments. Not meant offensively or saying that you are wrong in you comments, but typically the thread goes on with other people probably finding another list of things. I did say it was picky! haha! No probs! That car looks stunning! I’ve seen pictures of the Ferrari many times before but it never gets old – and I’m pro-Mclaren. The arms won’t stick through the car, as in RFT F1 2008 will they? If that’s a problem, is it possible to make the arms go down first as to stop the issue? I loved the promovideo, guys! Wow that’s editing skills, I have to say. I’d like to know the soundtrack of this promovid? 🙂 Enjoy the rest of the weekend! I think its great that you are having an addon for arms simply even though they look fake it still works with adding immersion. Too bad ISI cant update rFactor with animations from simbin 🙂 I dont think simbin would mind considering how amazing your mod is shaping up to be. @Mike: I think simbin would mind and the only thing weirder I can imagine is modder-sueing F1rstiRacing sponsoring us making a mod for rFactor. Toby, our policy in images is to not to edit them in any way. Confirmed. The picture was not edited in anyway, in fact it was cropped out from my screen res at 1440×900, so is even lower res than it would be, my AA level is 2 and AF 2 so no tricks 🙂 with regard to animation we will be reasy for that,and rF2 will have it. The driver model is prepared for animation with a rig (bone)structure and they will move just as in simbin titles when rF2 is ready. When they are working on RF2 its long long time ago RF1 was released. I can say that CTDP can spend as much time they want now when im busy with MMG 2007 V2 mod. 🙂 Cant wait your mod thought.